DRDO has invited bids for Diehl Track System 570 Z0 for fitment on 5 Arjun MBT Mk-2 tanks. Diehl, a German defense equipment manufacturer, produces chains and drive components for a wide range of military vehicles worldwide including the 70-ton Leopard 2 MBT and Arjun Mk-1 MBT. Arjun Mk-2 is reportedly undergoing 5 phase user acceptance trials, of which three phases have already been completed. Improvements suggested in each phase are being implemented before the start of the subsequent phase. The concluding fourth and fifth phases of user trials will begin in May 2014. In the fourth phase the tank would be tested for obstacle crossing and medium fording (water) capabilities. There are 89 improvements being undertaken on the Mk II tank, out of which 74 are related to equipment fitted on the tank and the remaining 15 are other improvements such as ammunition development. 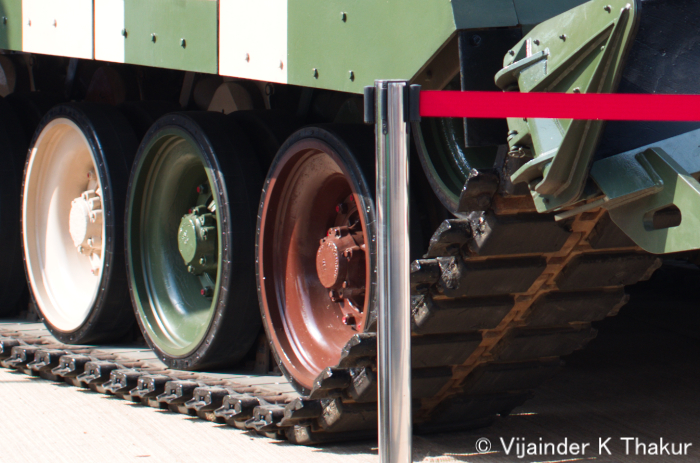 So far the prototype tank has covered over 5,000 km as part of the DRDO and user trials. The Indian Army has already placed orders on Heavy Vehicles Factory (HVF), Avadi, Chennai for 124 Arjun Mark-II tanks. The additional 124 MBTs would help the Army to raise two more regiments of the indigenous tanks. Production of the first batch of Arjun Mark-II MBTs is likely to start by 2015.